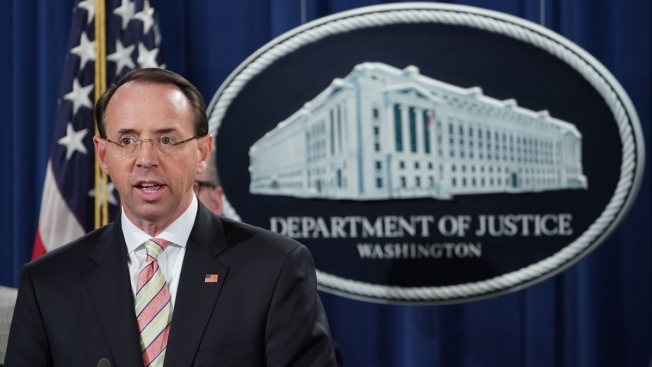 This Nov. 28, 2018, file photo shows Deputy Attorney General Rod Rosenstein at a news conference announcing efforts against computer hacking and extortion at the Department of Justice in Washington, D.C.
A source close to Rosenstein said he intends to stay on until Mueller's investigative and prosecutorial work is done, NBC News reported. The source said that would mean Rosenstein would remain until early March. Several legal sources have said they expect the Mueller team to conclude its work by mid-to-late February, although they said that timeline could change based on unforeseen investigative developments.